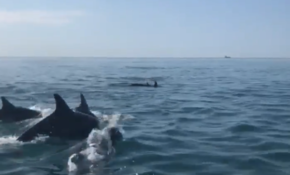 What an amazing way to start the week, dancing with dolphins in the clear waters of Sandown Bay! Watch Kian Forster's video, but please also note the warning from the experts. A member of the public asked the Town Clerk if they would apologise for calling Sandown residents 'Scum'. She refused, stood up and drove off. Cabinet member for children's services approves primary school extending their provision from 4-11 to 4-16 from September 2018 to ensure secondary education remains in Sandown. Altering The Bay Primary to deliver provision up to 16 is a step closer. The council also reveal that only 34 people responded to the public consultation about changes to secondary education in Sandown. Sandown council have created the conditions where the owner of the Needles Park can lease Sandham Gardens. A public consultation takes place later this month. Sandown Bay welcome a brand new team of three clergy who will take charge of six Church of England parishes in the area. Share your ideas about how to improve the Bay by joining in at the The Campfire Sessions & Firepit Forums. Check the dates and pop them in your diary. Sandown Town council has arranged for RNLI Lifeguards to provide safety cover for the town's beach this summer - a first for the RNLI on the Isle of Wight. The Sandown 'acid attack' that shocked the Island back in June, leaving a young woman with extensive flesh burns and near-loss of her sight, has concluded its court case.